Years back the Takasago Corporation invited me to speak at a sensory symposium in Japan. Through the kindness of Dr. Kunio Yamazaki, my postdoctoral mentor at the Monell Chemical Senses Center, and his wife Tomoko, I had already acquired some basic familiarity with Japanese culture—including sushi. I’d met quite a few visiting scientists from Kirin, Ajinomoto, Takasago, Shisheido, Shimizu and other big companies there. So I bought myself a Japanese phrase book, had bilingual business cards printed up, and climbed on a plane. I gave my speech in Tokyo, visited with the Takasago’s perfumers and scientists, and wandered around the city at all hours. I loved it—the food (tiny salted fish on rice for breakfast—yeah! ), the department store greeters, the elevator ladies with white gloves, the soft drinks with names like “Pocari Sweat.” Everything seemed familiar but just slightly off-kilter in a wacky way. Pachinko parlors, for example, feel like amusement arcades but the players have the deadly serious air of slot machine addicts. Nothing was weirder than Japanese television—I’d stay up for hours watching it in the hotel, especially the bizarre commercials featuring a young guy in a suit and wrap-around shades who was pitching some kind of tonic drink. The best thing I did was secretly cash in my bus tour reservation (graciously provided by my hosts who assumed I would want to be with other tourists, no?) and board a bullet train for Kyoto, that city of unbelievably beautiful temples and gardens. A businessman on the train insisted on buying me a beer and recommended that I stay in a ryokan—a traditional inn. Good call. 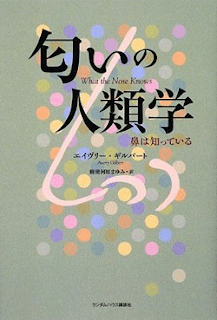 Anyway, these pleasant memories—and associated smells: there’s a fermented soy note that lingers in small back streets everywhere—came rushing back when I opened a copy of the brand new Japanese edition of What the Nose Knows—translated by Mayumi Teshigawara. First Nerve readers know that Japan is a world leader in technolfactory innovation. I hope WTNK will resonate there. Please take me next time! Did you see the museum Takasago has in Japan??? Congrats on the Japanese edition! OK, let's go! Didn't see Takasago's museum but went to an exhibit of Lalique glassworks--something I'd never paid attention to before. Another national/municipal museum has ink scrolls by the old masters--incredible. Darnit! First I read Della's book, and now this. Obviously, I have to go to Kyoto . . . It is interesting to see the difference between the American and Japanese design on this book from a culture perspective.